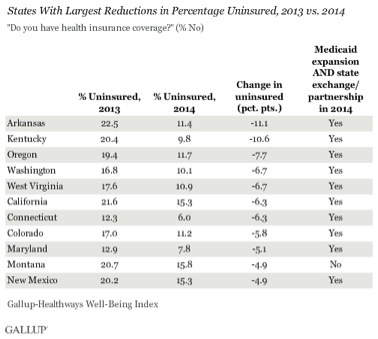 A new Gallup survey has found that the two states with the most dramatic drop in their respective rates of uninsured are Kentucky and Arkansas, both deeply red in presidential years. The Kentucky rate plummeted from 20.4 to 9.8 percent, while the Arkansas rate dropped from 22.5 to 11.4 percent, Gallup found. In Kentucky, the state's Republican Party, led by Senate Majority Leader Mitch McConnell, has been steadfastly opposed to the health care law that enabled its rate of uninsured to be cut in half over the past year. McConnell has repeatedly called for Obamacare to be repealed "root and branch," while Congress has voted scores of times to rescind it. It remains law. Arkansas overcame some GOP opposition and accepted an expansion of Medicaid authorized by the Affordable Care Act, contributing significantly to the halving of its own uninsured population. Kentucky Gov. Steve Beshear, a Democrat, has leaned into Obamacare rather than grudgingly implementing it. The state version is known as Kynect, a local branding that allowed residents who oppose Obama to take advantage of his health care reform without swallowing their pride. A middle-aged man in a red golf shirt shuffles up to a small folding table with gold trim, in a booth adorned with a flotilla of helium balloons, where government workers at the Kentucky State Fair are hawking the virtues of Kynect, the state’s health benefit exchange established by Obamacare. The man is impressed. "This beats Obamacare I hope," he mutters to one of the workers. “Do I burst his bubble?” wonders Reina Diaz-Dempsey, overseeing the operation. Red states that did not expand Medicaid or embrace a state-run exchange continue to have brutally high rates of uninsured. All 10 of the states with the highest uninsured rates have refused to carry out those two key parts of Obamacare. 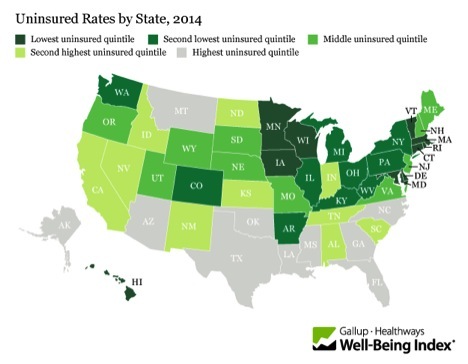 "States that have implemented two of the law's core mechanisms -- Medicaid expansion and state health exchanges -- are seeing a substantially larger drop in the uninsured rate than states that did not take both of these actions," Gallup announced. "Consequently, the gap in uninsured rates that existed between these two groups in 2013 nearly doubled in 2014."